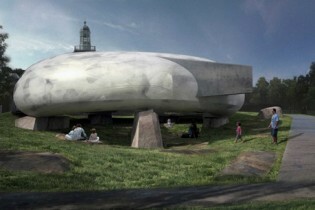 The 2014 Serpentine Gallery pavilion has been designed by Chilean architect, Smiljan Radic. 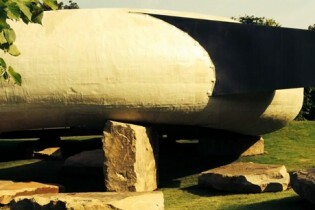 Described by Gallery Director, Julia Peyton-Jones, as ”A futuristic design that looks like it is from the Stone Age”, Radic’s pavilion comprises a translucent and fragile-looking torus resting lightly on top of large, roughly hewn stone plinths. Covering a footprint of 350 square metres on the lawn directly outside the gallery, the structure will provide a flexible social space to accommodate the gallery’s Park Nights series of events throughout the summer. 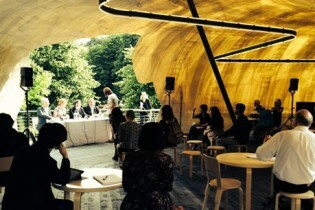 This is the sixth year we have been invited to construct the pavilion, each one of these unique structures providing us with the opportunity to work with a diverse array of different materials, often in new and exciting ways. We manufactured the hollow structure from paper-thin sections of semi-transparent fibreglass, carefully replicating the hand-made look and feel of the design. As darkness approaches and the interior is lit from within, the pavilion takes on a gentle, ethereal glow, adding to its sense of strangeness within its surroundings.